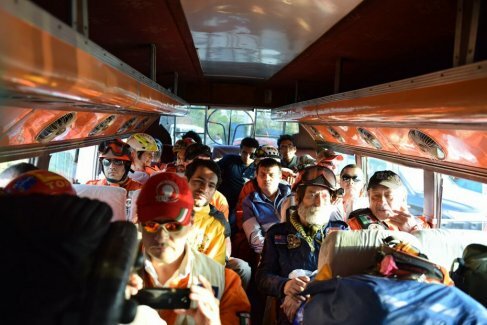 Scientology Volunteer Ministers arranged transport for 16 Topos members to the disaster zone to assist with rescue effort after April 25 temblor. 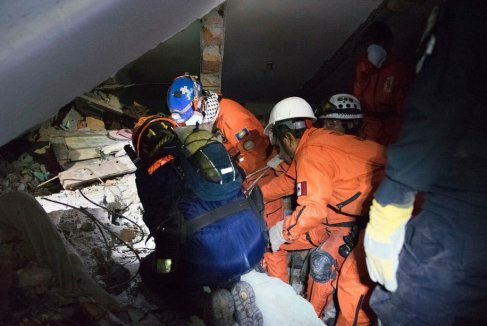 Under the leadership of longtime first responder Hector “El Chino” Mendez, a 16-member contingent of Mexico’s Los Topos search-and-rescue team was flown to the center of the disaster zone in Kathmandu, Nepal, in the wake of the devastating 7.8 magnitude earthquake of April 25 – risking their own lives to comb through the rubble for survivors. During their first 72 hours in Nepal, the Los Topos members got by on no sleep and hardly any food, working round the clock to locate survivors and excavate the dead who were buried under landslides and inside destroyed buildings. 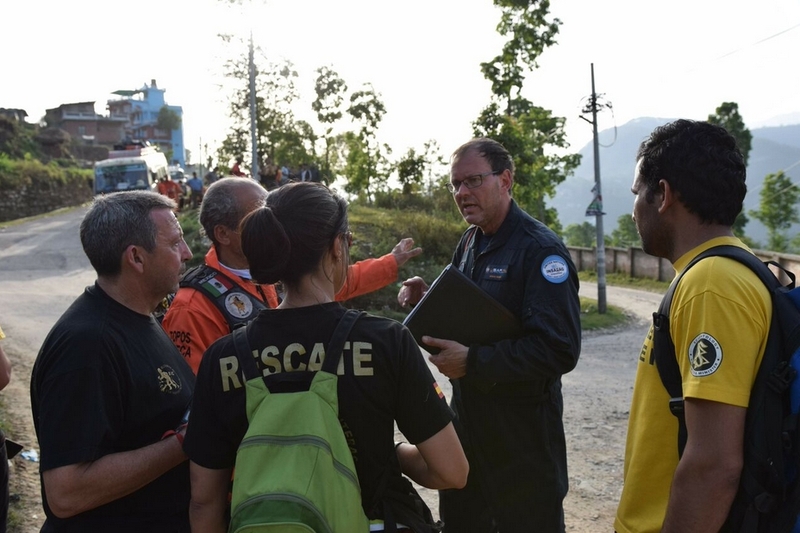 The Los Topos team met with the disaster response coordinator from INSARAG (International Search and Rescue Advisory Group, which operates under the United Nations to direct disaster response) along with the Firefighters Without Borders from Spain and the Canadian Search and Disaster Dogs Association (CASDDA) and a team of Volunteer Ministers including the VM who directs operations for Kathmandu. There was a map on which the word “Tatopani” was circled to denote the worst-hit and most treacherous village to tread. And that’s naturally where Los Topos understood that their services were most urgently needed. On the border of China in central Nepal, Tatopani sits 113 kilometers from Kathmandu, typically taking 2 ½ hours to reach by highway but predicted to take more than 4. The Topos were warned of the trip’s dangers due to the extensive damage wrought by the earthquake, along with more than 70 aftershocks and the attendant landslides and mudslides. They decided to leave for the district immediately, and – with the Volunteer Ministers team to handle logistics and support – they took a creaky Nepali bus in hopes of finding a way through the landslides. Arriving in Chautara, where 90 percent of the homes were destroyed, Los Topos heard a rumor that someone was buried in what was once a building. The villagers urged them to find the cadaver, afraid that tigers and other wild animals were devouring the dead. Los Topos left for the site with a five-man team and torches. After several hours they were able to assure the villagers there was no body, no stench – and no feral tigers. Venturing farther into the mountains, they arrived at what was once a thriving resort for extreme-sports enthusiasts located at the top of a gorge in the mountains and aptly named The Last Resort. The owner invited them inside for a bite and some shut-eye, but Los Topos heard about a bus that was crushed by a landslide and that a woman might still be inside. They rushed to clear a path to the bus, excavated the woman’s remains and turned them over to the Nepali Army. Several villagers drove them up a canyon road, passing abandoned and destroyed villages. The few survivors were left to camp out in a plaza. Landslide damage made any further use of vehicles impossible, so they ventured on foot. On the way back to The Last Resort, the volunteers recovered a body that had been missed by the army sweep. While a small team scouted ahead, they passed out food to refugees who were making their way to Kathmandu, and provided food and water for a team of Nepali Army rangers setting off for the mountains on foot. Packing light, they next set out on a 14-kilometer trek, with helmets provided them by the owner of the resort. In a small village, a man appealed to them to help him find his wife. He pointed up to the mountains above the main road. “Looking up, we could see the result of a landslide—and there was no evidence that any houses ever existed on the hillside,” recalled one of the VMs. “The man motioned to a small pile of rocks and through his expressions, we could understand that family members were underneath it." The Topos immediately jumped into action. One pointed to a pile of debris and insisted the family was inside there. The man stood by patiently while they moved huge rocks, stones, dirt and debris to recover the remains and personal effects of his wife. No other family members were found. It took two hours for them to finish the task, carefully wrapping the woman’s remains and carting them down the hill. The man gently motioned to where they should leave his wife’s body. The Topos ended their mission in Tatopani, a few hundred meters from the Nepal/China border. 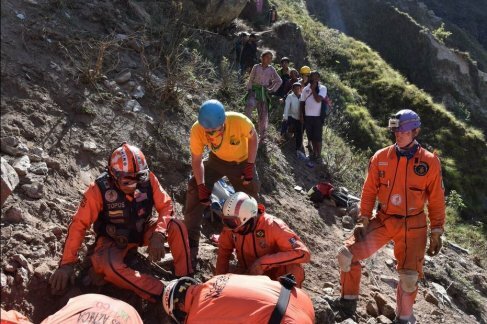 El Chino met with the officer in charge of the army unit stationed at the checkpoint, who told him the search and rescue effort had been terminated. The Topos and other teams returned to Kathmandu a day later. 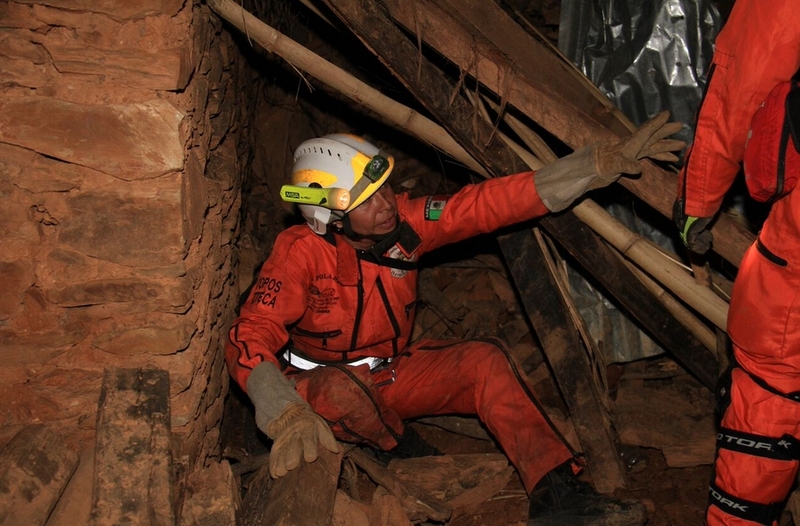 The search and rescue phase over, Los Topos continues on in Nepal on disaster response. As they are trained emergency medical technicians, they are providing medical care, and they are shoring up buildings that can be salvaged, and helping to demolish those that cannot. To date, the death toll from the quake has swelled to nearly 8,000, with more than 17,000 injured. As many as 800,000 are said to be without habitable homes due to the earthquake and subsequent aftershocks, landslides and mudslides. Outbreaks of cholera and other diseases are feared with the beginning of monsoon season less than six weeks away. First working together in Haiti after the 2010 earthquake, Los Topos and the Scientology Volunteer Ministers have struck a strong partnership, responding together to hurricanes, fires, earthquakes, and tsunamis in nations the world over. 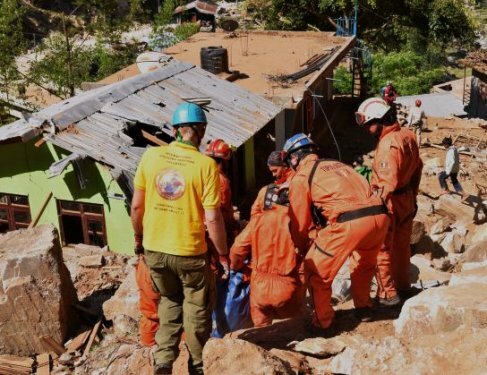 Mexican Volunteer Ministers have trained as Los Topos search-and-rescue specialists, and Hector “El Chino” Mendez and other members of his team have completed training as VMs to help with the emotional and spiritual needs of survivors. Lost Topos searched for bodies in a ravine—it was rumored people were buried there. Los Topos heard a rumor that someone was buried not too far from their camp in Chautara and set off to rescue them or find their remains. 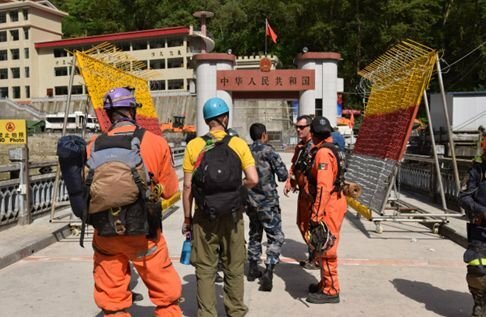 A few hundred meters from the Nepal/China border, El Chino learned that the Nepal earthquake search and rescue phase had now been terminated. The Los Topos/ Scientology Volunteer Ministers team meets with the INSARAG (International Search and Rescue Advisory Group) coordinator, who dispatched search and rescue teams to areas most affected by the April 25, 2015 earthquake. Looking for victims buried in a collapsed house. 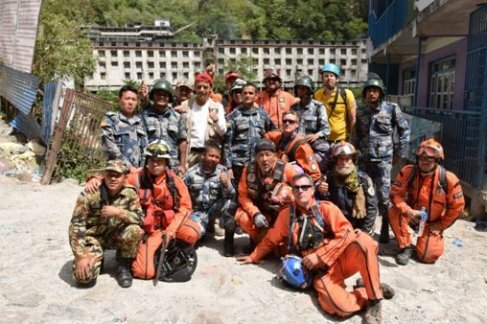 During their first 72 hours in Nepal, the Los Topos members got by on no sleep and hardly any food, working round the clock to locate survivors and excavate the dead who were buried under landslides and inside destroyed buildings. En route to Tatopani, right on the border of China—one of the villages hardest hit by the earthquake. 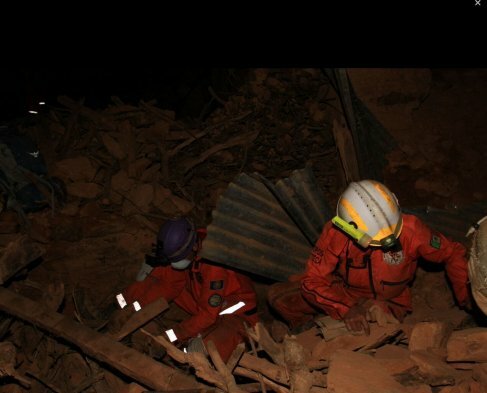 First responders relax after three grueling days of search and rescue after the 25 April earthquake.